Terminator Genisys is so focused on referencing the first two Terminator movies that it forgets to be a good film in it’s own right. Beyond the initial layer of robot smashing, the Terminator franchise has always been a storied conflict of interpersonal drama with intertwined themes of fate and destiny. Leads Jai Courtney and Emilia Clarke, sadly, take their opportunity to display a complete and utter lack of skill in the former department, opting instead for the time-tested dramatic technique of wooden performances. On the other hand, Arnold Schwartznegger is back as yet another T-800, and he’s killing more Terminators than ever before. Going back to the root of the series, Terminator Genisys opens with John Conner (Jason Clarke) and Kyle Reese (Jai Courtney) raiding Skynet just as the original Terminator is sent back in time to kill his mother, Sarah (Emilia Clarke). To save his mother, John sends Reese back in time to save her from the robotic assassin sent to kill her and thus prevent Skynet’s fall. Thus, events follow the same track as they did in the first movie. Until Kyle arrive back in time to find not the T-800 he was sent to kill, but a liquid metal Terminator like that from Terminator 2, played by Byung-hun Lee. With just a single line of dialogue in the entire movie, Lee manages to portray the T-1000 as more intimidating and more threatening than either of the other two antagonists in the film. His sequence lasting all of just twenty minutes is able to remind the audience just exactly why Terminators are supposed to be threatening when the regular robo-skeletons can be blown up with relative ease. The issue here is the Conservation of Ninjutsu. Each side in a conflict must have a limited amount of ninjutsu, else the side with more badassery realize that it’s within their means to slaughter their opponents and end the film within two seconds. 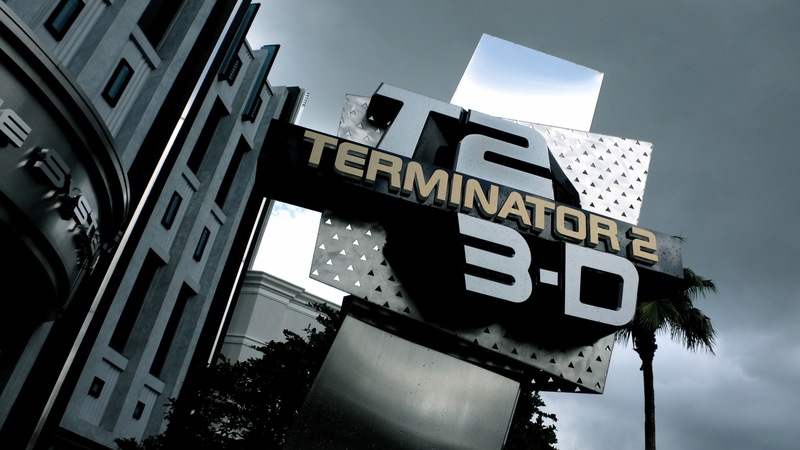 Thus, just a single Terminator, a significant menace for Kyle and Sarah in the original film from James Cameron, becomes a complete joke to be easily obliterated by the Resistance’s laser guns at best, and strung up like marionette puppets for ridiculously absurd plots to infiltrate the Skynet headquarters at worst. Thus, because the T-800 is now just a regular bad guy minion to be mowed down, and the T-1000 is just the first boss that you would defeat in a video game’s tutorial stage, we come across spectacle creep. The stakes have to be higher across the board in each installment compared to the last, because that’s what keeps people coming in to buy tickets. We can’t settle for a regular robo-skeleton anymore, now the new villain is the T-3000 who can regenerate from a single cell. Just one jump back into the past isn’t enough anymore, now time itself needs to start unraveling so that everything can be at stake. Properly managed, spectacle creep doesn’t have to be a bad thing. It doesn’t have to make the previous adventures the audience has seen come across as meaningless compared to the higher stakes of the current conflict. But in a series like Terminator, where there has always been a focus on character drama, the idea of controlling your own destiny and what it means to be human, making larger conflicts isn’t the answer. It makes sense how having a giant time-travel mashup would be appealing; The idea is attractive to fans of the franchise like setting out whiskey is to a hive of wasps. It could very well serve as the backdrop to an excellent story and a movie fully deserving of the Terminator franchise. It could have been, but Terminator Genisys simply doesn’t live up to that expectation. It has most of the ingredients director Alan Taylor would need to make a terrific installment. 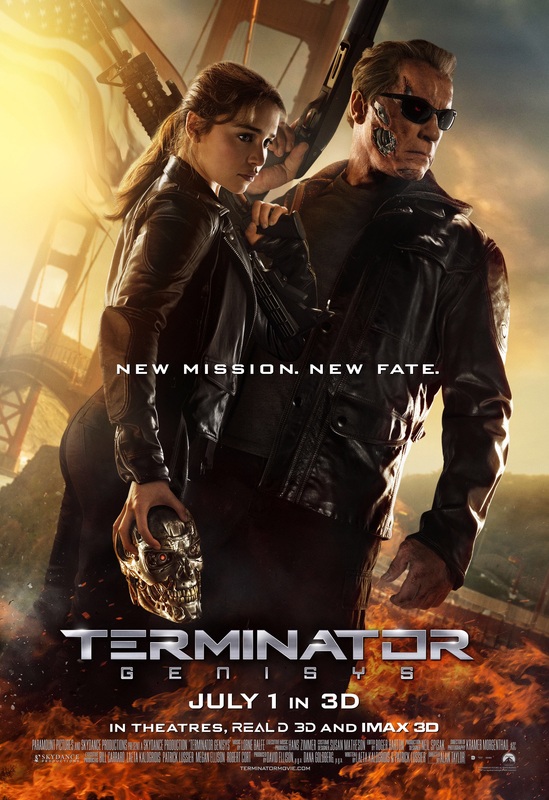 Arnold is back and better than ever as Sarah’s guardian, the T-3000, who’s actor won’t be named due to spoilers, truly is menacing and capable, and the plot allows them to use whatever devices from the last four movies they need in order to tell a good story. Everything that was needed to make this a good movie was there, and Alan Taylor still managed to screw the pooch on this movie. Jai Courtney and Emilia Clarke are not good thespians. They are a black mark on any work they are involved in, they have a clear lack of depth in their performance, and I simply expect better from those with a career in film. This isn’t one of the movies you should see on Tuesday for a discount. This isn’t a movie you should see in any way, shape or form. You shouldn’t see it in 3D, you shouldn’t see it in IMAX, or on Blu-Ray, or Netflix, don’t even steal this movie because even if it’s for free, it will never be worth your time. Throughout not just the short lifespan of PopcornFlicks, but the long and historied life of cinema itself, there have been countless examples of action movies that still had depth in plot and were worth watching. Terminator Genisys is not one of them, and the only way that Paramount and Hollywood will learn is if we hit them in their wallets, right where it hurts.